Lock Ridge Park, located between Church and Franklin Streets is open daily from dawn until dusk. Enjoy the bluebells, festivals, trails, fishing and history! Iron transformed Alburtis from a sleepy farm village into an industrial giant. The railroad, the iron horse, steamed into town in 1864, bringing together nearby raw materials needed for iron-making. By 1868 Lock Ridge Furnace lit the skies, turning iron ore into the iron essential for a growing America. 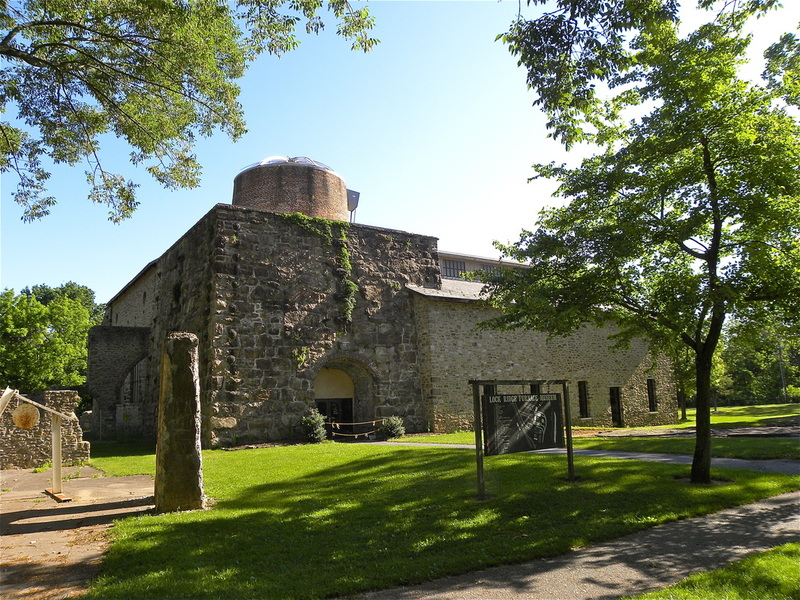 In the late 1800s the Lock Ridge Furnace plant was a smelly, dirty, noisy inferno. Trains loaded with anthracite coal to fuel the furnaces roared up to the stock houses. An endless stream of rattling wagons hauled heavy loads of local iron ore, as well as the local limestone used to extract the iron from its ore.
Ironmen, including many Irish and German immigrants, worked in twelve-hour shifts. “Bottom men” shoved heavy wheelbarrows full of iron ore, limestone, and anthracite coal onto elevators. Above, “top men” waited to dump these regional riches into Lock Ridge’s twin furnace stacks. Nearby stoves heated air, and roaring engines blew it into the furnaces. This fiery blast made the furnaces hot enough to burn anthracite coal. Day and night Lock Ridge’s furnaces flamed, separating iron from iron ore and shaping it into bars. Four times a day, sweating “casters” pulled the plug at the bottom of each furnace. Wearing protective wooden shoes, casters guided the red-hot melted iron into bar-shaped channels in the cast-houses. When the iron cooled, casters swung crowbars to break the bars apart. Loaded onto train cars, the bars left for market. Then the iron industry began moving west. Western Pennsylvania’s softer bituminous coal could be made into coke--the best fuel for iron-making. Unable to compete with furnaces nearer this new fuel, Lock Ridge closed in 1921. Today, local preservation efforts have saved this relic of industrial might for future generations. The Park is owned and operated by Lehigh County. To reserve a pavilion, please call 610-871-0281.